On a January day, we visited Stephanie Wheeler at her Atlanta-based studio. Under a canopy of hundred-year-old oak trees, her charming studio is tucked away in a secluded neighborhood, just on the outskirts of the busy city. “I first saw this 1930s bungalow in 2002. The house with its keebler front door and dilapidated building in the back garden – I knew the potential immediately. It was the first and only house I saw that day with the real estate agent and the rest is history,” Stephanie says. It is evident immediately that Stephanie is in the midst of preparing for the spring show at Market Hill. Through the arched garden gate, one can see many freshly gessoed canvases drying in the sunlight. Inside the studio, fresh layers of oils cover her canvases in all stages of completion. Her passion for color is another immediate takeaway as you glance around her studio. “Color is everything. It sets the overall mood for my pieces,” she says. Recent travels in Thailand and Vietnam bring a direct vibrancy to her color palette at this season’s spring show. 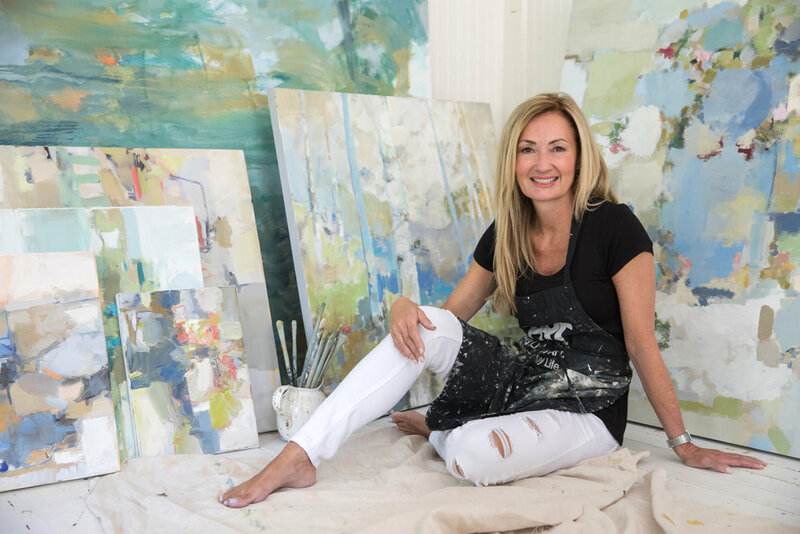 Her canvas collection ranges from abstracts to landscapes along with works on paper and fascinating layered collage pieces. It’s a beautiful and powerful experience to be in the presence of her works of art. Come enjoy what she has created for us at Market Hill.